1. Move to the Lab tab. 2. Select the test to order. You can choose a test from the right-hand lists, or by entering it manually. 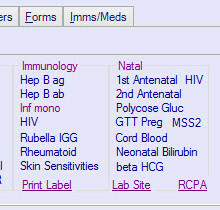 Different tests are available under the tabs for Lab, Other Lab or Indications. 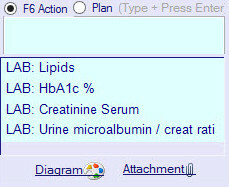 Under the Indications tab, you can select a group of tests based on what you are checking for. Under the Lab tab, you can visit the Lab or RCPA website by clicking on the links. To manually enter the test, search using the orange Search box on the left. Type in part of the name and press [Enter]. Any tests you order will appear in your “Actions” box. You can delete a test by clicking on it and pressing [Delete]. In the orange Venue box, type part of the organisation’s name and press [Enter]. You can then search your address book for the correct details. If you do not specify a venue, the tests will be sent to your practice’s default Lab. In the white “Note” box, you may add text to guide the lab. For example, you may specify the location of an injury when ordering an X-ray. Clicking on the left-hand links will add your consultation notes. e.g. If you click “Hist”, the notes you have written in the History box for this complaint will be imported as a note. Clicking on X Testsafe will prevent these results from being shared through Testsafe. In the orange Copy To box, enter the name or code of any other recipients and press [Enter]. You can then search for practitioners or organisations in your address book. Tick the Track box to create a Task to track these results. In the Notify By box, you can enter the patient’s preferred mode of communication e.g. email. Tests can be printed on separate sheets if you specify the page number. The default is to print the minimum number of pages. On the bottom right of the screen, click Preview to view your lab form. In this window, you may wish to save the lab form as a PDF, Email it or Print it. All lab forms will be printed automatically when you complete the consultation and click “Finish”.